Friday, August 3 from 7:00 p.m. until 8:00 p.m. In 1926, professional musicians Constantine Shapiro, born in Moscow in 1896 and Lydia Chernetsky (Odessa, 1905) met and married in Berlin, Germany, after their respective families had suffered continuous persecution in war-torn Russia, or the Soviet Union, as it was known after 1922. With Hitler’s national socialism on the rise, remaining in Berlin was for the newlyweds out of the question, and they decided to continue their odyssey, first to Palestine, then China, ultimately to spend the World War II years in the relative safety of Japan. In 1931, they found themselves in Japan, where Isaac, son number four and author of this memoir, was born. A few years later, with World War II imminently looming, and the subsequent bombing of Pearl Harbor, their lives were disrupted once again. In 1944, the Yokohama shore was banned for foreigners and the Shapiro family, including their five children, were forced to move to Tokyo, where they survived endless hardships, among others the intensified strategic United States bombing campaigns on the city. Operation Meetinghouse started March 9, 1945 and is regarded as the single most destructive bombing raid in human history. The Japanese later called the operation the Night of the Black Snow. During the subsequent American occupation of Japan, 14-year-old Isaac, being multi-lingual, was hired as an interpreter by John Calvin ‘Toby” Munn, a United States Marine colonel, (later promoted to Lt. Gen.) who, when the war was over, paved the way for Isaac, or Ike as he soon became known, to immigrate to the United States. In the summer of 1946, Isaac landed in Hawaii, at the time a United States territory, altering the course of his life forever. 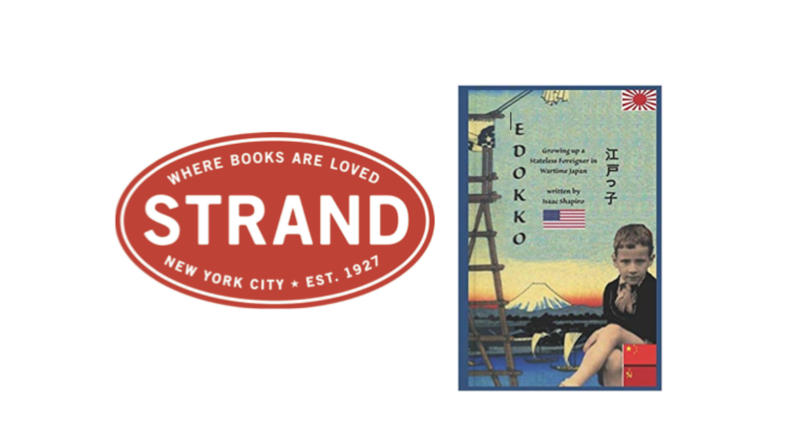 Isaac shares his story from his book Edokko: Growing Up a Stateless Foreigner in Wartime Japan in Strand’s Rare Book Room. To purchase tickets, please visit Strand’s website. Please note that “Admission & Signed Copy” grants you admission for one, plus one signed copy of the book. “Admission & Gift Card” grants you admission for one, plus one $15 gift card to our store. Seating is available on a first come, first served basis. Admission and the signed copy and/or gift card will be available only for pick-up at the event, so please select “in store pick-up” as your shipping method. Payment is required at the time the order is placed. You may also purchase admission in the store at the registers, or at the time of the event in the Rare Book Room. If you order a book but do not attend the event, your book will be held at the Strand’s basement holds desk for one week after the event. If you cannot attend but would like to purchase Isaac’s book, you can pre-order a signed copy here. This event will be filmed by C-SPAN’s BookTV.